Do you believe in Miracles? Yes NOW I DO! IN every conflict there comes a turning point. In the 1971 war against Pakistan, the Battle of Longewala in the western sector was one such point. Not only was the enemy attack dented, they were also forced to withdraw and defend when India launched its own offensive. Longewala was, thus, a decisive battle. A body of 84 Punjabi infantry soldiers with neither artillery nor tank support, neither minefield of any kind nor air support, and with a lonely long winter night ahead of them, decided the outcome of this battle. There were also four soldiers of the BSF camel division. All this was in favour of the enemy, who launched an offensive with the 51 Infantry Brigade of about 3000 men and 22 Armoured Regiment. This was the scenario on December 4 night (1971), when the Pakistanis crossed the international border heading for Longewala, 16 km from the border. The post was held by 'A' Company of 23 Punjab under Major (later Brigadier) Kuldip Singh Chandpuri. The Pakistani plan was to have breakfast at Longewala, lunch at Jaisalmer and dinner at Jodhpur. The action opened at 2.30 a.m. on a moonlit night when the first Pakistani attack was launched. Much gunfire pierced the desert night. As the enemy tanks, Chinese made T-59s, came within range, 'A' Company's two recoilless (RCL) guns opened up, each eliminating an enemy tank. The assaulting armour was jolted to a halt, but the infantry assault continued. As the Pakistanis approached 'A' company defenses, they were confronted by a barbed wire fence of three stands. This halted the infantry attack too, as the enemy thought this indicated a minefield. Smoke and desert dust added to the confusion. This fence was erected just to mark the boundary of the Longewala post, to keep BSF camels in - 10 of them - and keep other animals, like wild camels, out. The enemy's heads were kept pinned down by the withering small arms fire from the post's defences. Two hours later, the enemy attacked again from another direction. The result was much the same, as 'A' Company refused to give ground. This attack too petered to a halt, with the perimeter fence again creating doubts in the enemy's mind. Just before the first light appeared at 6.30 a.m. on December 5, the Pakistanis attacked yet again with venom from yet another direction. Longewala Post was now virtually surrounded by the enemy. Dawn was not far behind, and it revealed to both the Pakistanis and the Indians their relative positions. An enemy tank lay stalled just 50 meters from the defenses - in perfect working condition and abandoned by its Pakistani crew. Smouldering enemy tanks dotted the scene not much further away. The night's work had warmed the hearts of the 'A' Company boys and they now anticipated a major armour assault, with the screen of darkness lifted from the battlefield. The structures making up the Longewala Post, and much of its defensive positions, had been subjected to a murderous enemy medium artillery battering all night long. The huts, a smouldering rubble at dawn, had lit up the night sky earlier. The tank destruction was aided by barrels of diesel fuel loaded on the tanks to take them to Jaisalmer and beyond, before administrative echelons caught up with the planned Pakistani advance. When a tank was hit, the extra diesel had literally added fuel to the fire. All night long, Major Chandpuri was requesting for tanks and reinforcements. When day broke, help arrived proverbially from the heavens. A lone air reconnaissance sortie failed to locate enemy tanks and asked for assistance. Two light aircraft of the artillery's Air Observation Post (Air OP) were quickly on the scene, directing Hunter aircrafts to their kills. It was now a case of a cat being set among the pigeons with the Pakistani air force busy elsewhere. The IAF boys had it all to themselves at will. Enemy tanks were like sitting ducks, without any cover of even shrubbery to protect them. With extra drums of diesel on them, every time a tank was hit they were virtually incinerated. When the IAF pilots ran out of tank targets, they took a heavy toll of the enemy vehicles, with hundreds of them pock-marking the sandy panorama. The IAF did a truly first-class job, sending the enemy into complete disarray, back across the border. "Major Kuldip Singh Chandpuri, the company commander who took the brunt of the attack, and fought with great grit, courage and determination, was awarded a very well deserved Maha Vir Chakra (MVC)." The Pakistani Divisional and Brigade Commanders, assigned to capture Longewala, were both sacked. It is believed that the three Pakistani infantry commanding officers and the armoured regiment commander, and many more, also suffered the same ignominy. Indian field intelligence acquisition was poor. Such a large combined Pakistani force, concentrating opposite Longewala, should have been known in advance. Indian strategic intelligence was virtually inadequate, as it was unaware of enemy troop movements opposite the Jaisalmer sector. The Indian 12 Infantry Division made attack plans in the absence of this information, forcing last minute changes in plans from attack to defence. Excellent Army and Air Force cooperation ensured our success at Longewala. Pakistan had no air cover for its attack, resulting in its virtual rout. It is not solely the numbers that matter. Determination, resoluteness and leadership too count. Major Chandpuri had not even a full company complement of infantry, and no other protection yet he stood firm against an overwhelming Pakistani attack. Pakistan's infantry force was almost 30 times greater in strength. The Punjabis had no armour all night long, whereas the enemy had about 60 tanks. It was the Pakistani leadership that did not press its attacks with determination and showed no resoluteness and poor leadership in front of the Longewala Post fencing. This especially, when the post was surrounded. 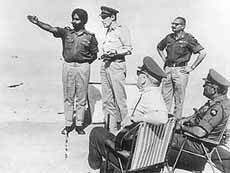 The Punjabis' refusal to capitulate, confused the enemy leaders. What would have happened if 'A' Company of 23 Punjab had lost heart and abandoned Longewala Post? The Pakistanis would really have had dinner at Jodhpur as there was virtually no Indian defence in between and there is no prize for guessing what that would have entailed. This really was an epic battle that saved Rajasthan. Three weeks after the battle, the then Defence Minister, Jagjivan Ram, speaking at Jalandhar, described the people of Punjab as brave and heroic. He congratulated them for making a grave for Pakistani tanks at Longewala. A very significant tribute was paid to the Punjabis' achievement, against unbelievable odds, by none other than Britain. Its Chief of the Imperial General Staff, Field Marshal R.M. Carver, especially visited the battle scene a few weeks later, to see for himself the miracle at Longewala.